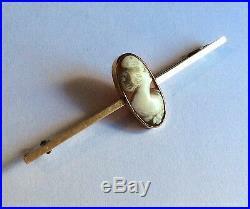 Antique Edwardian bar brooch, with a very finely carved small shell cameo. 15ct (impressed mark on the back) rose gold, with a ring on the back at one end for attaching a safety chain. In very good condition - see photos. Size - 5.6cm long x 1.8cm at deepest, approx. All items will be carefully packed. You can see confirmation and date of dispatch in your'won' list. The item "Antique Edwardian 15ct gold bar brooch with very finely carved small shell cameo" is in sale since Sunday, July 17, 2016. This item is in the category "Jewellery & Watches\Vintage & Antique Jewellery\Vintage Fine Jewellery\Edwardian (1901-1910)". The seller is "imagestotreasuregreetingcards" and is located in London, London. This item can be shipped worldwide.